Patients presenting in the emergency room with flank pain suggestive of acute ureteric colic may have alternative underlying conditions mimicking ureteric stones. An early diagnosis and appropriate treatment for other causes of flank pain is important. The majority of centers around the world are increasingly using un-enhanced helical CT (UHCT) for evaluation of ureteric colic. This study was conducted to determine the incidence and spectrum of significant incidental diagnoses established or suggested on UHCT performed for suspected renal/ureteric colic. Urologist and radiologist reviewed 233 consecutive UHCT, performed for suspected renal/ureteral colic along with assessment of the medical records. Radiological diagnoses of clinical entities not suspected otherwise were analyzed. All other relevant radiological, biochemical and serological investigations and per-operative findings were also noted. Ureteral calculi were identified in 148 examinations (64%), findings of recent passage of calculi in 10 (4%) and no calculus in 75 examinations (32%). Overall the incidental findings (additional or alternative diagnosis) were found in 28 (12%) CT scans. Twenty (71%) of these diagnoses were confirmed by per-operative findings, biopsy, and other radiological and biochemical investigations or on clinical follow up. A wide spectrum of significant incidental diagnoses can be identified on UHCT performed for suspected renal/ureteral colic. In the present series of 233 consecutive CT examinations, the incidence of incidental diagnosis was 12%. The application of UHCT for the diagnosis of acute ureteric colic has positively influenced the practice of urology and uro-radiology. The technology allows the rapid and accurate determination of the presence of stone in the urinary tract. Since the pioneering study on the role of UHCT in the evaluation of ureteric colic by Smith et al  in 1995, a number of studies have shown the superiority of non-contrast enhanced CT over IVU and Ultrasonography [2–5]. Its sensitivity and specificity is reported to be more than 95% and 96 % respectively [1–6]. An important disadvantage is a higher radiation dose to the patient . Denton  noted a difference of 2.5 mSv versus 4.7 mSv in the radiation dose to the patient between IVU and UHCT performed for renal colic. Advantages of UHCT includes rapid scan time, avoidance of contrast related hazards, cost effectiveness, high accuracy, and its ability to suggest an alternative diagnosis for flank pain. This last characteristic of UHCT is valuable in diagnosing many significant diseases earlier in their course, which may be helpful in decreasing the associated morbidity. In this study, we are presenting our initial experience of diagnosing alternative or additional diseases on UHCT performed for the evaluation of acute flank pain. 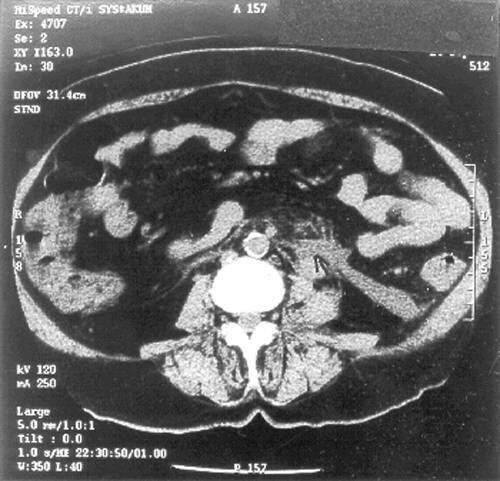 The radiologist's reports on CT, CT films and medical records of 233 consecutive patients, performed between July 2000 and August 2001 at a University Hospital for suspected renal/ureteral colic were reviewed. 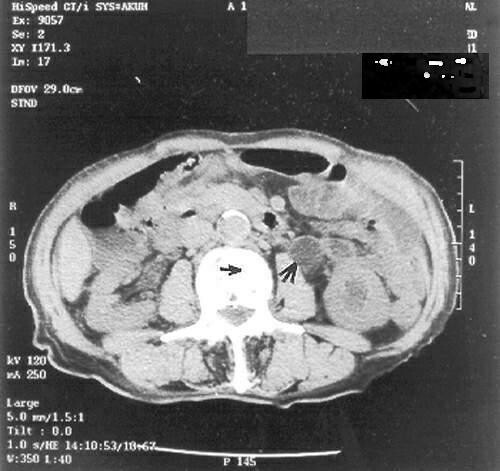 The UHCT were obtained on a Cti/pro single slice helical CT scanner (General Electrical medical systems, Milwaukee, WI). The exposure factors setting were KVp 130 and mAS 200–250. All scans were obtained from the upper border of T12 vertebral body to the lower border of symphysis pubis using 5 mm collimation, without the use of oral or intravenous contrast material. Patients were placed in supine position with full urinary bladder at the time of the UHCT. Additional prone films were taken whenever the radiologist needed a better description of suspected distal ureteric calculi. Radiological diagnoses of clinical entities otherwise suspected were analyzed. All relevant radiological, biochemical, serological investigations as well as per-operative findings were also analyzed. From July 19, 2000 to August 15, 2001, 233 patients had UHCT for the evaluation of acute flank pain. Ureteral calculi were identified in 148 examinations (64%), findings of recent passage of calculi in 10 (4%) and no calculus in 75 (32%) scans. Thirty-two of the conservatively managed patients were lost to follow up and therefore were not included. In the remaining 201 patients, sensitivity and specificity of UHCT in diagnosing calculi was 99% and 98% respectively while +ve and -ve predictive value was 99% and 98% respectively. Twenty-eight patients (12%) had alternative or additional diseases (other than renal, ureteric or bladder stone disease) diagnosed on UHCT. Table 1 describes in detail the alternative or additional diagnoses. Alternative diagnoses to ureteric colic made by UHCT. In 71 % of these cases, diagnosis was confirmed by the surgical procedure, biopsy and biochemical evaluation (in case of pancreatitis) as shown in Table 1. A wide variety of significant or potentially significant diagnoses can be identified on UHCT performed for suspected ureteral/renal colic [9–13]. Apart from its high sensitivity and specificity for diagnosing stone disease, the characteristic of UHCT, which discriminates it from other modalities, is its ability to pick up other unsuspected significant clinical entities. Early diagnosis of diseases such as appendicitis, cholecystitis, pancreatitis, diverticulitis and leaking aortic aneurysm that require urgent and prompt treatment could affect the associated morbidity and mortality associated with such diseases. In a large series of 1000 UHCT for suspected renal/ureteric colic, Katz reported 101 patients (10%) with alternative or incidental diagnosis. Table 2 shows some of the major series published to date on this subject. Among the major series published on the subject [9–13], the incidence of unsuspected clinical entities was 10–15%. The disease pattern is remarkably similar in most series (Table 2). In one report from Albert Einstein Medical Center, Philadelphia, Marcella et al  noted an unusually high incidence of incidentally discovered renal cell cancer. There is low incidence of diverticulitis in South Asia and we have found no case of diverticulitis in our series by comparison to other series. It is important that in the absence of ureterolithiasis, particular care should be taken to rule out alternative diagnosis for flank pain. In our series, early diagnosis of pancreatitis, cholecystitis, mesenteric lymphadenitis, pyelonephritis and appendicitis, initiated early treatment. The alternative diagnosis of eight tumors in our series and similar trends in other series is interesting. It suggests that UHCT may change the prognosis in many cases that would otherwise be diagnosed late. A 70 year gentleman presented with a three month localized left flank pain. It was mild to moderate in intensity. UHCT showed (Fig. 1) gross hydronephrosis and hydroureter with 1 cm mid-ureteric calculus (Rt. Arrow). Incidentally, hyper-dense bony deposits were detected in the L3 vertebral body (Lt. arrow). Later, a raised PSA and histopathology of prostate biopsy confirmed adenocarcinoma. A 40-year old lady presented to the emergency room with a 12-hour history of severe left flank pain radiating downwards and backwards. She was tender in the left flank and hypochondrium. Her urine examination showed microscopic hematuria. An initial diagnosis of left ureteric colic was made. However, UHCT showed an inflamed pancreatic tail (Arrow). A raised amylase and lipase confirmed the diagnosis of acute pancreatitis. A wide variety of significant alternative or additional diagnoses can be reliably identified on UHCT performed for suspected renal/ureteric colic. In the present series, such diseases were diagnosed in 12% of cases. Unlike most series from the West we did not note any case of diverticulitis. MHA conceived the idea, helped in the analysis of data and participated in writing the manuscript. JR conceived the idea, helped in the analysis of data and participated in writing the manuscript.